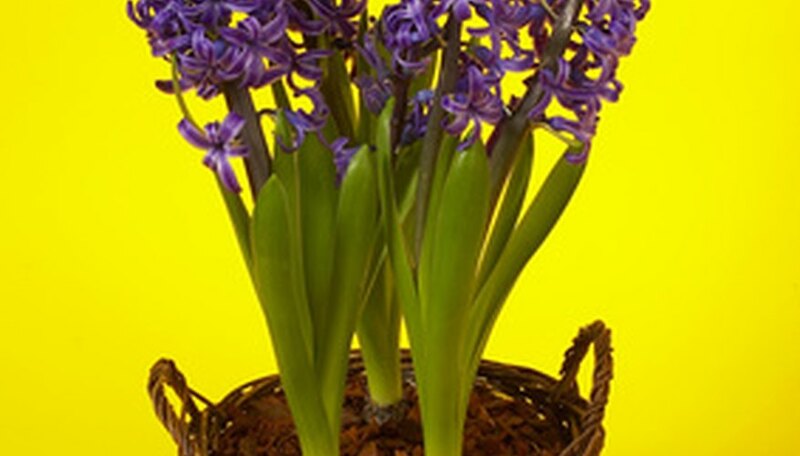 The moist conditions necessary for forcing hyacinth bulbs can encourage the proliferation of mold. These mold spores are not caused by the moisture however. If mold develops on your forced hyacinth bulbs, spores were already present on the bulbs or storage container. Check newly-purchased bulbs for mold spots before you take them home. Clean your storage containers with bleach before you use them each season. If your bulbs develop mold during forcing, throw them away. Blue mold is a common hyacinth bulb mold. It may cause the bulb to turn soft, pink or soft and rot in the container before it has a chance to germinate. Or, if the bulb does produce, the resulting plant may develop root rot in the now-infected soil and die. Throw away bulbs that have developed blue mold immediately. Grey mold is caused by a common soil fungus. This fungus is highly contagious and can be spread by splashing water or even by plant foliage simply touching moist, infected soil. Infected hyacinth bulbs will develop spots that look water-logged. Affected bulbs should be thrown away. White mold is caused by a soil-borne fungus that survives out of the soil by feeding on bulbs. Bulbs infected with the fungus that causes white mold will have dark, hard scab-like patches attached to them. After the bulb germinates, the mold will attack hyacinths' leaves. The symptoms are grey or yellow sunken spots on the foliage that grow larger as the mold multiplies or powdery white mold patches on the underside of the leaves.